Use our service to search and find great prices for your ferry or Eurotunnel crossing. Compare prices from different ferry companies in one search. Use our ferry and Eurotunnel Le Shuttle ticket search engine to compare rates on all the most popular routes around Europe. MoneyMaxim is where you can compare prices from different ferry companies and book cheap tickets. We have more than 50 of the leading European ferry companies to choose from, including P&O Ferries, DFDS Seaways, Stena line, MyFerryLink, Brittany Ferries, Irish Ferries, LD Lines and Condor Ferries, Try us now for the widest choice. So we have made getting a cheap ferry as easy as possible. 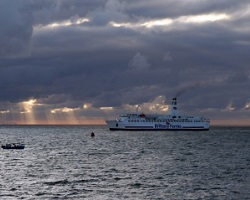 Use MoneyMaxim to track down the cheapest ferries to France, the Channel Islands, Ireland, Spain, Holland and beyond. We have so many ferry routes to pick from, including Dover to Calais, Holyhead to Dublin, Portsmouth to Le Havre, Plymouth to St Malo. We don't believe there is a company out there offering more choice than we do. So what are the factors that will influence your decision? Where you are travelling from? If you are within striking distance of Kent then either the Dover ferry crossings or Folkestone Eurotunnel Le Shuttle will probably be your first option - however, if you have a long drive from the North, do consider routes from Newcastle and Hull to Holland. These can be particularly attractive if travelling to the heart of Europe although less so if heading for South West France or Spain. Again, if travelling from the West Country or South Wales, the Portsmouth or Plymouth crossing are another option. The advantage with these routes is that you have the potential to sleep on the ferry overnight, enabling you to be fresh for your onward journey the next day. Most online route planners allow you to calculate routes including tolls and fuel, both of which are really important when comparing the overall cost of your trip. The shorter crossings are almost always cheaper, although sometimes there are some great deals off season on the longer trips. The reason behind that is that the ferry companies know you are a captive audience on their ship for a number of hours, and so therefore you are likely to spend money with them! Ferries also tend to be cheaper on the Dover or Ramsgate sailings than Eurotunnel Le Shuttle (unless you are prepared to take an unpopular middle of the night train) - but not always - check out your options using our price comparison service to get the best balance between price and convenience. Also check out our Ferry and Eurotunnel Le Shuttle Discount and Special Offers Page - if there are offers in the market currently we will be promoting them there. Ferry prices operate with what is known as 'dynamic pricing'. This basically means it's supply and demand which will impact on the price you pay - so school holidays and particularly public holidays see prices rise dramatically, and off season there are great ferry and Eurotunnel Le Shuttle bargains around. What is true is that the more flexible you are the better your chances of getting a great deal - consider going at times that others might view as inconvenient times (i.e. very early morning, or the middle of the day). Ferry prices, particularly from Dover and the Kent ports can be much cheaper even at peak holiday times. Some routes that might take a half hour longer, such as those to Dunkirk also tend to be cheaper. Remember, whichever route you travel, you will need to make sure you have got adequate car insurance for the continent, European breakdown cover, holiday insurance, and if booking independently potentially supplier failure insurance. If you are going abroad for a lengthy period we also offer information about long stay European car insurance. Be aware that if you are planning to take a rental car abroad you need to make sure that your car hire company is happy that you do so. Some will not allow rental cars to be taken on ferries, some will not offer insurance abroad, some charge a great deal more in both overseas travel supplements and charges for European breakdown cover. You can compare car hire prices using our service, or speak to one of our team if you feel you need additional assistance.